Wednesday, March 10 minutes before the start of our IWD event…We had a bit of technical difficulties with the projector and the screen but a case of Rosé the Riveter wine and 2 candy bars gave the right “height and angle” so that the DVD on Madre was seen full screen! I just got home from the winery... happy and so proud to host the celebration of International Women’s Day for the seventh year. Tonight we actually launched another decade celebrating IWD on the Olympic Peninsula. 10 years ago Nancy Newman and a small band of women first gathered at Hollywood Beech to honor the vital accomplishments and contributions of women before us. Preparing for tonight I reread all our past press releases and realized how the themes of each event have become so much a part of our lives at the winery, as women of the community and the local/international charities supported by our donations. 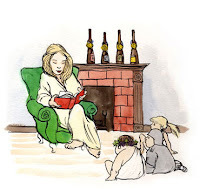 Standing there tonight, looking out at old friends, new faces, and young girls all crowded the full length of our tasting room, I re-read a quote by Margaret Mead. March 8… International Women’s Day was established in 1922 marked by women's groups around the world, commemorated at the United Nations and is designated in many countries as a national holiday. While it is not a U.S. national holiday it should be! 2010 Marks a New Decade and some of our greatest challenges both local and across our world. Tonight our donations will be contributed to Madre, an international women’s human rights organization, to deliver medication and medical supplies to Haitian earthquake victims via the Dominican Republic. Haitian women as ‘caretakers in their community’ play a vital role in remote villages in getting aid to those that need it most. I'm in Seattle at the NW Women's show which is really good for you. I'm offering introductory pricing only at the show just for you. We're popping the cork this weekend and tasting our Sparkling Twilight.... a champagne style Syrah. I love sparkling wine for a lot of reasons but I recently found two new ones. I've been doing a bit of reading on champagne lately thanks to a Christmas present from Lisa... the book, 'The Widow Clicquot'. Barbie-Nicole Clicquot was described as a tenacious entrepreneur who not only saved and grew the Clicquot Champagne Empire but also opened new horizons for women in business and forced those around her to reconsider the gender stereotypes of her day... All this starting at the age of 27 in the early 1800's. This made me think of our "Rosie". There was another quote in the book I also liked... In the first decades of the 18h century, not long after champagne was discovered, the powerful Madame de Pompadour put it best: Champagne is the only wine that leaves a woman more beautiful after drinking it!